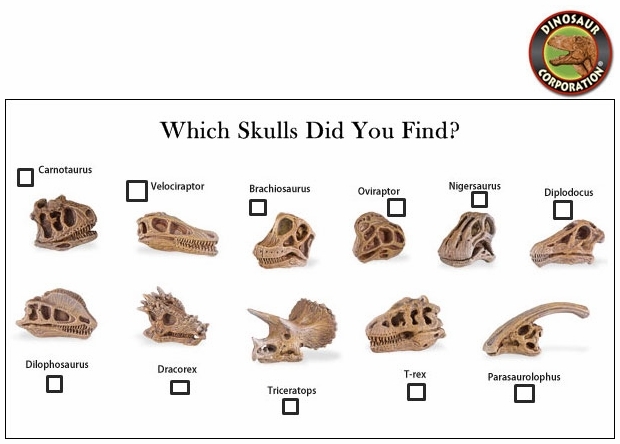 * Prehistoric themed collection of dinosaur skulls. Dig a Dino! * Prehistoric dinosaurs fossil skulls replicas for kids fossil excavation game. * Dig for dinosaur in sand and you will discover Jurassic and Cretaceous dinosaurs: Carnotaurus, Velociraptor, Brachiosaurus, Oviraptor, Nigersaurus, Diplodocus, Dilophosaurus, Dracorex, Triceratops, Tyrannosaurus, and Parasaurolophus.